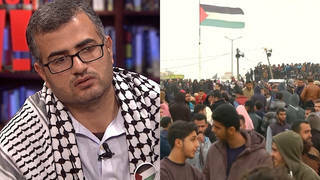 Judge Goldstone Retracts Part of His Report on Israeli Assault on Gaza, Leaves Rest Intact | Democracy Now! co-editor of the book The Goldstone Report: The Legacy of the Landmark Investigation of the Gaza Conflict. He writes for Mondoweiss.net, a news website devoted to covering U.S. foreign policy in the Middle East. co-editor of The Goldstone Report: The Legacy of the Landmark Investigation of the Gaza Conflict. She is an independent journalist based in New York City. JUAN GONZALEZ: Israel has called on the United Nations to retract the Goldstone Report on the 2008-2009 Israeli assault on Gaza after its author backtracked from some crucial findings. Judge Richard Goldstone chaired a fact-finding mission which said both Israel and Hamas were guilty of war crimes in the conflict. In an editorial in the Washington Post on Friday, Judge Richard Goldstone said, quote, “Civilians were not intentionally targeted [by Israel] as a matter of policy.” This claim stands in direct contradiction with what Judge Goldstone said when the findings were first revealed. JUDGE RICHARD GOLDSTONE: We detail a number of specific incidents in which Israeli forces launched direct attacks against civilians with lethal consequences. These were, with only one exception, where the facts established that there was no military objective or advantage that could justify the attacks. JUAN GONZALEZ: About 1,400 Palestinians, including hundreds of civilians, and 13 Israelis were killed in the devastating conflict. Israel launched Operation Cast Lead with the aim of ending cross-border rocket fire from Palestinian militants. To discuss the implications of Judge Goldstone’s position, we have with us in the studio — we’re joined by Adam Horowitz and Lizzy Ratner. They are co-editors of an abridged version of the U.N. investigation, titled The Goldstone Report: The Legacy of the Landmark Investigation of the Gaza Conflict. LIZZY RATNER: Thank you so much. ADAM HOROWITZ: Thanks for having us. JUAN GONZALEZ: Starting with you, Adam, your reaction to the op-ed piece in the Washington Post? ADAM HOROWITZ: Right, well, I was very surprised to read the piece in the Washington Post, but I also think that the initial reaction, especially from Israel supporters, is misread. It’s being characterized as a retraction. And if you read the op-ed, Judge Goldstone actually only comments on one small part of the report, which I take as an implication that the rest of the report stays intact and that he is still in support of that. JUAN GONZALEZ: And the main thing that he retracts? ADAM HOROWITZ: He talked about one small point. He said that there was not a policy, an intentional policy, to target civilians. This was something that was mentioned in the report, but it was just one small issue. Much larger was the issue of intentionally attacking the civilian infrastructure of Gaza, which he doesn’t mention, and the idea of just disproportionate and indiscriminate violence, which he doesn’t address and which affects civilians disproportionately. JUAN GONZALEZ: And hasn’t the problem been from the very beginning that there was no cooperation whatsoever from Israel in terms of the initial investigation, or even in terms of the United Nations human rights investigation that has followed and came out with a report recently, Lizzy? ADAM HOROWITZ: Yeah, and if I can add just one piece there, in the op-ed, Judge Goldstone says, you know, “If I knew what I knew now, or if I had had access to Israel, the report would have looked different.” And Israel supporters are using that statement to try to discredit the entire report. Judge Goldstone has said that all along. He said all along that if he had had access to talk to Israeli political and military leaders, Israeli civilians in Sderot and other affected areas, of course the report would have looked different. I mean, that is a — that’s a commonsense point that he’s been making all along. JUAN GONZALEZ: And it seems to be, here in the United States, his retraction of a portion of the report has gotten far more coverage than the original conclusions of his report when it first came out. ADAM HOROWITZ: Yeah. No, I think that’s true. I mean, there’s an article in the Times today highlighting that and highlighting the Israeli strategy now to try to have the entire report retracted by the U.N., although in Ha’aretz this morning, the Israeli newspaper, they’re already saying that there’s no way that the U.N. is going to retract the report, that there’s no way one op-ed in the Washington Post can outweigh a 500-page U.N. report that had, you know, months of research and — that has gone into it. LIZZY RATNER: And it’s important to point out that there were four commissioners who oversaw the creation of the Goldstone Report. Richard Goldstone was the lead commissioner, but there are three others who have in no way retreated an inch from the report. And, of course, as Adam has said at the beginning, Goldstone’s retreat is a fairly — it’s a modest retreat. Most of the report still stands. And one can even question the claim he makes, that there wasn’t intentional targeting of civilians. JUAN GONZALEZ: And the claim that Israel really has gone after those rogue elements in the military who may have been involved in the targeting of civilians, that were not, quote, “part of Israeli policy,” supposedly? LIZZY RATNER: Right. Well, this is a very, very important point. Goldstone says in his essay that he reaches the conclusion that Israel didn’t intentionally target civilians, because Israel has conducted a number of investigations, they’ve been credible, and they all suggest that this wasn’t policy. And then he goes on to cite — Goldstone goes on to cite this report, as I mentioned, by this Committee of Experts, which was charged with investigating how Israel and Hamas were following through on the recommendations of the Goldstone Report, and he says that this report by the Committee of Experts kind of validates this idea that Israel has done credible investigations. Interestingly, if you read this report on the Committee of Experts, which came out two weeks ago, it says the exact opposite: it says, yes, Israel has begun investigations into 400 incidents, but that these investigations have taken far too long, that they’ve been inconclusive in many cases, and that, in fact, Israel in no way showed any willingness or ability to look into whether or not there was an intentional policy of targeting civilians. JUAN GONZALEZ: Well, Adam, we just have about a minute, but the importance of whether the Dahiya Doctrine revealed that Israel was targeting civilians — can you talk about what that Dahiya Doctrine was? ADAM HOROWITZ: Sure, the Dahiya Doctrine is the war doctrine that Israel first used in the 2006 attack on Lebanon, which basically said that any area that they were receiving fire from, they would consider the entire area to be a military target. Dahiya is a neighborhood in Beirut that was absolutely flattened. Leading up to Operation Cast Lead in Gaza, the Israeli military and political command was very clear that they were going to recreate Dahiya in Gaza. And many people, including Judge Goldstone and the Goldstone Report, say that’s exactly what happened. And that’s one of the most damning charges of the Goldstone Report, which Goldstone does not address in this op-ed, that there was an intentional policy of collective punishment, of attacking the civilian infrastructure, the electricity, the food, the people of Gaza, to punish them for having elected Hamas. And that’s a charge that still stands. JUAN GONZALEZ: We’re going to have to leave it there, but we’ll certainly be following this in future broadcasts. We’ve been speaking with Adam Horowitz and Lizzy Ratner. They’re co-editors of an abridged version of the U.N. investigation, titled The Goldstone Report: The Legacy of the Landmark Investigation of the Gaza Conflict.